I really like fine thread for piecing 50wt or 60wt thread. Aurifil is a favorite as is DMC Machine Embroidery thread. Silk thread is another favorite for quilting. Libby Lehman’s “Bottom Line” is another nice thread line. As a machine embroiderer as well, I love Hemmingworth, Madiera, Floriani and Marathon Threads. Polyester threads have stunning colors, a beautiful sheen and I can’t get enough of them. I quilt with them as well when a quilt needs it. Love your color choices! Now to enter the drawing! OOOOOOOH yummy!!!!! So fine is my all time favorite thread. It is pretty much the only solid thread I use any more. I also like King tut, Lava, Rainbows, for variegated and Glitter for my metallic. All by Superior. I still have tons of Bottom line from before So Fine…I’m using that for applique now. Ohhhh, a thread junkie’s dream come true, yum! I love Superior Threads too, Lynn got me started on those when I bought my machine and I never looked back. So Fine is what I use most, for the same reasons as you. Love King Tut (spendy, oy!) too, and their metallics. Don’t have much call for them, but they’re sure pretty sitting on the shelf; thread bling. If I’m cheating on Bob, I like Sulky cotton; it runs and looks great, but seems to be lintier than KT. Heck, for stuff like fill, where strength isn’t an issue and the color is what I need, I’ve raided my garment thread stash – Gûtermann, Mölnlycke, Mettler – Elsie May will run ’em just fine. Hi, my name is Judy and I’m a threadaholic!!!!!! LOL My “drugs” of choice…..Superior Sew Fine, King Tut, Isacord…..all of which run beautifully on both Grizabella and the Bernina. Sorry, couldn’t resist as I almost fell off my chair when I opened your blog and saw that stash of thread!!!!!! 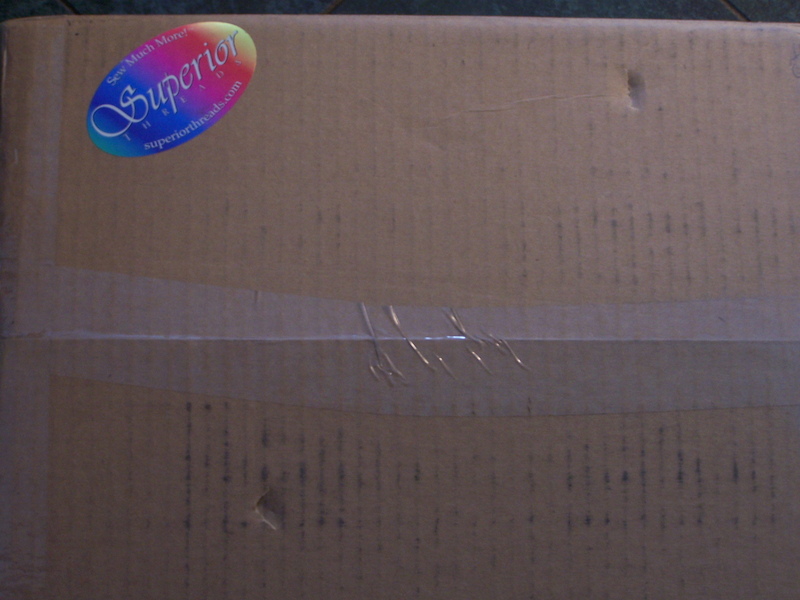 I love it when a box arrives like this! Haven’t had one for a while so it’s almost time… I generally use Superior Rainbows for most quilts, I have almost all of the colours so I can find something that works with just about any quilt. My next choice is SoFine if a customer doesn’t want to see too much thread on the top. Bottom Line works best in my bobbin and I love prewounds! Have you ever tried a Neti Pot for your sinus headaches? You can get them at the health food store or online… My aunt has been a yoga teacher for years and swears by them…. I use mine when allergy season hits and I don’t have to take anything anymore! I think I love all thread but I do really espeically love Superior threads! You should have saved this post for Valentine’s Day – it’s a love festival! LOL! But I digress……..I have used Signature and YLI – they are both a bit trickier in my machine. It does love Maxilock Swirls and I use them – but the lint is out of this world. There is a color….Mocha Almond Fudge – doesn’t that sound yummy – that is browns and rusty reds and tans and it works so well on so many quilts. I use it a LOT!! Wow! That is some beautiful color!! I use Permacore from A&E, LAVA and KingTut from Superior and BottomLine in the bobbin (pretty much exclusively). Nancy H gave me some ARC in gold that runs great. A little heavier and shows nicely…very, very occasionally, I run Superior Metallics. Oh Randi wow that must have been fun to order and receive! 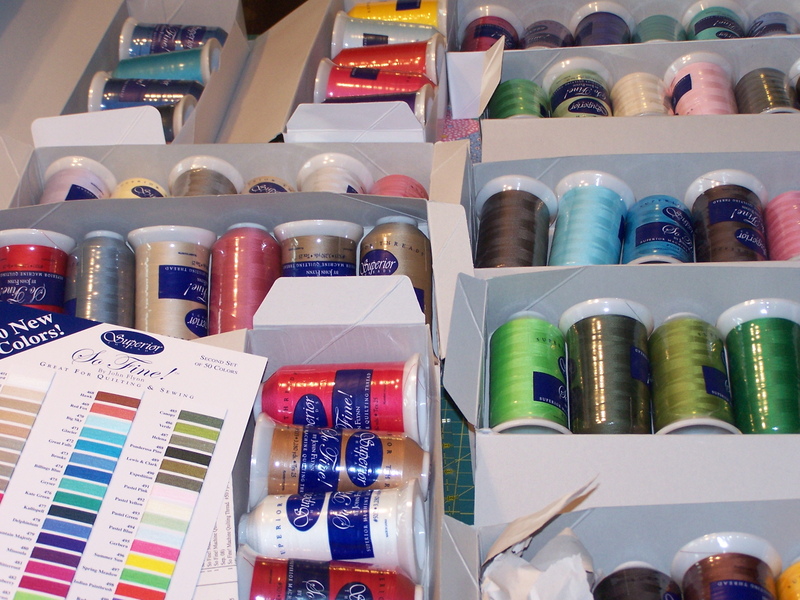 Almost all of the thread I use is Superior, Sew fine, Bottom line, Rainbows, Master Piece.. I started out using Permacore but ever since I switched to Superior threads I’ve never been able to get the tension right with Permacore. I’ve also always had tension trouble with King Tut too. King Tut is my favorite… esp. now that Bob’s bringing out more solid colors. And the So Fine is my second thread of choice. I especially like it in the bobbin with the King Tut on the top. Used to quilt with Masterpiece, but don’t so much anymore. I do buy the spools of MP and give them as gifts to my customers. What I *really* want to see, Randi, is where you keep all your threads???? I love Superior threads too. King Tut is my favourite for most things, but I also love Lava especially for kids quilts as it really shows up and comes in such fun colours. I love Aurifil and Masterpiece but I’m finding it very spendy to keep lots of colors in stock, especially with the Aurifil. I love the thin cotton threads. I have about 10 cones of Signature that I don’t use because they are pretty thick. So I have switched over to the more reasonably priced So Fine and Bottom Line and am having pretty good success with it. I tend to have more tension issues on the back with that combo but I like the thin threads a lot!!! I am also a big fan of Superior threads. I love how educational the website is. I have King Tut thread but for the life of me can’t get it to run on my Millie. I must say that after 2 1/2 years of longarming, I am just now able to solve most of my tension problems. It has been a rocky path!!! Randi, you got lots of pretty threads! I’m green with envy…. Ahhhh… such a lovely thread stash!! poetry really!